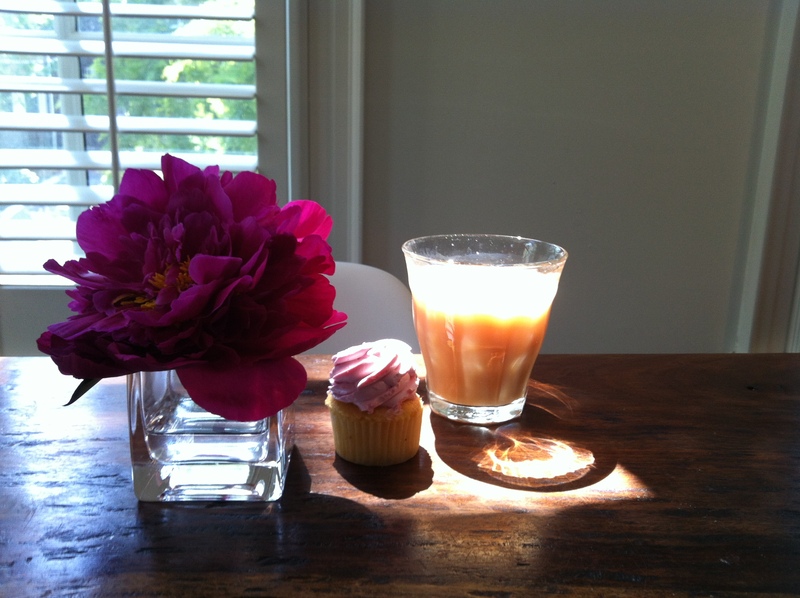 Flowers + Food : Perfectly Pretty | Izzy have you eaten? It is such a natural combination, isn’t it, to have flowers and food on the same table. Both bright and colourful (hopefully the food is!) and both products of the earth. I am an incomplete person without some flowers stuck in a jar where ever it is I call home. 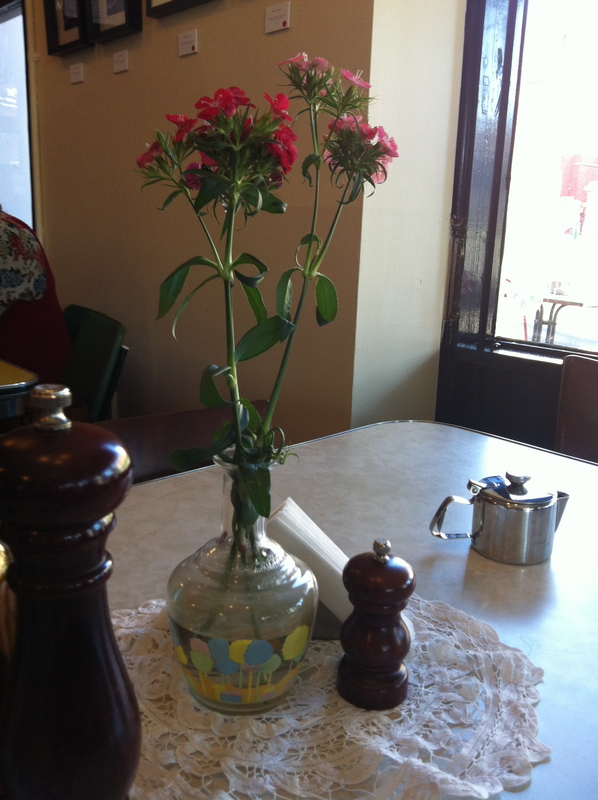 I caught you smiling as I photographed the simple stem of flowers at the cafe table in Melbourne: those small touches just make life better! 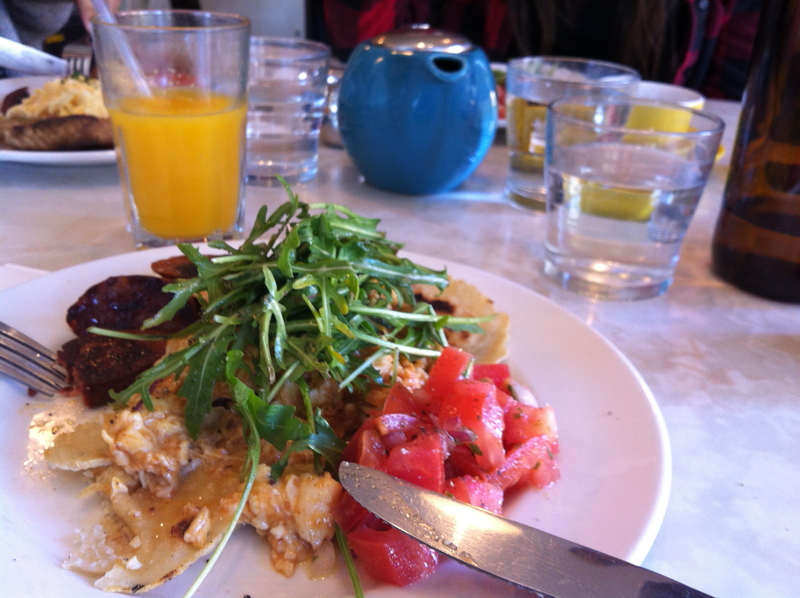 I am so glad that your ‘local’ is as whimsical and charming as that- I was so happy to have delicious breakfast with you at Cafe Lua in Carlton. Claudia and I even brought home a loaf of their excellent gluten free bread, it was that good. Excellent huevos rancheros on home made corn tortillas. Yes, it is always nice to have flowers on the table. No need for fancy, right? Do you remember the amazingly stylish flower arrangements we used to have in the house in Virginia for those big parties? Pretty awesome. The flavour now is for simple, simple: let the flowers speak for themselves. 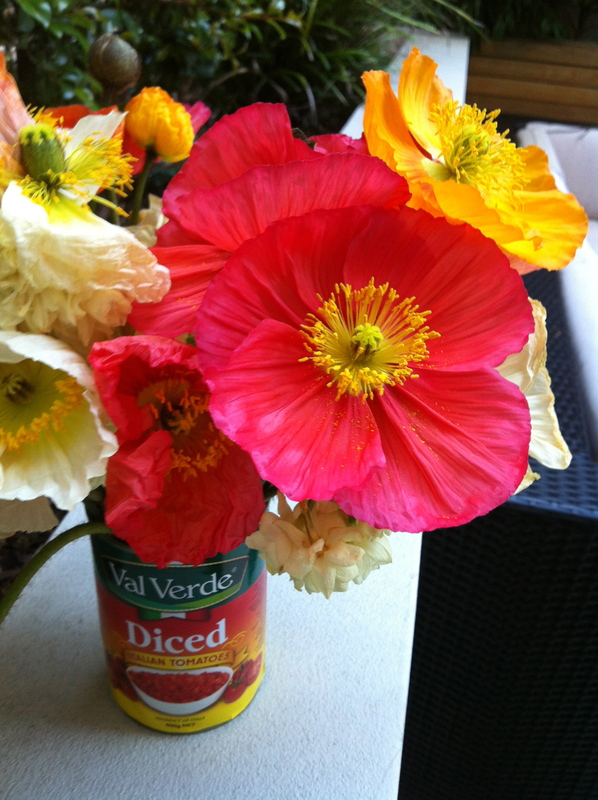 Foraging in the back lane at our Santa Monica house, I remember being trailed by a little house guest who was fascinated that I was collecting nasturtium flowers for our lunch time salad: What? You grown ups eat flowers too?? It made me think of how excited I would have been as a child to add flowers to a ‘real’ meal. Flowers on a cake are a beautiful decoration: who needs elaborate icing when you can dust some icing sugar on and sprinkle over with rose petals or lavender? Pretty! Not long before we left Toronto, I had an urgent call from my good buddy AK in St. Louis. A wonderful salad, she demanded. Please help me think of something. She was having one of her glamorous parties, and combined with a bright young caterer, she wanted to make a few dishes herself. 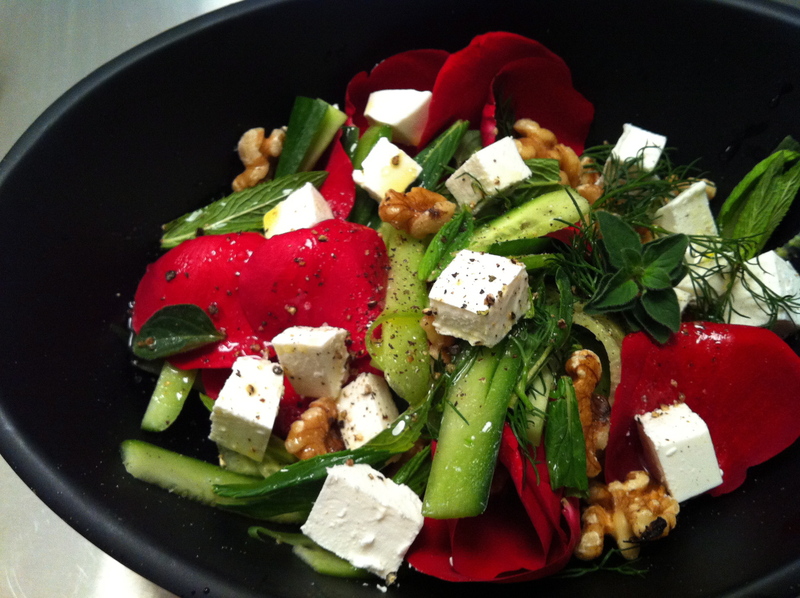 What about a Persian Rose Petal Salad, I asked? Apparently, it was a success, and blended nicely with everything else on the menu. I love this salad, and really have not made it as often as I would like. It is soft, and light, and oh so summery. Do try it, Izzy. It is also immensely pleasing to look at. This recipe is not with the traditional yogurt dressing. I made it tonight with just lemon juice and olive oil to keep it fresh and extra light. Sooo pretty to look at! Combine all the ingredients. Add a squeeze of lemon juice and a little olive oil, toss, and serve at room temperature. 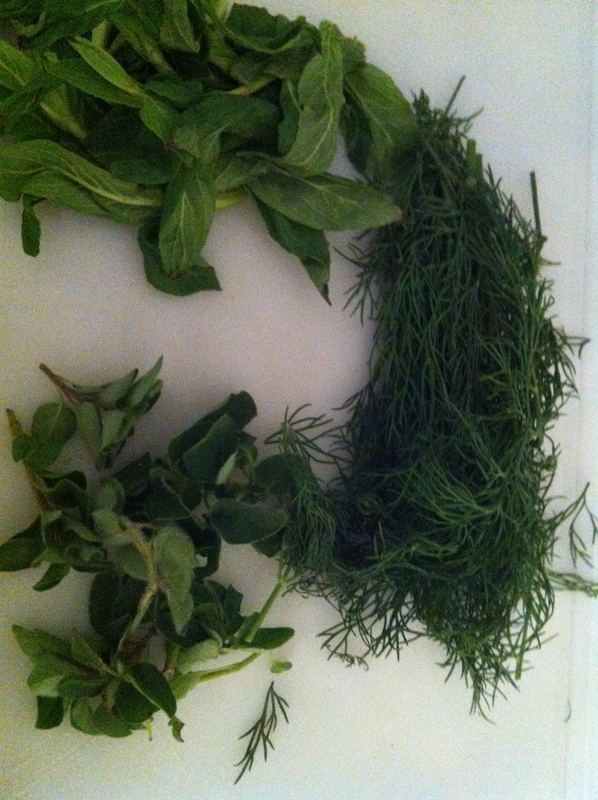 Perfect with grilled kebabs, or a piece of fried fish. It is so nice to be in the new house, Isabel! I cannot wait for your holidays so you can come up for a visit and enjoy it. Our shipment of household things arrives on Wednesday, and then CHAOS will reign for a while until we find a home for every book, spoon and bicycle. The W family are such wonderful supportive darlings through our whole move. 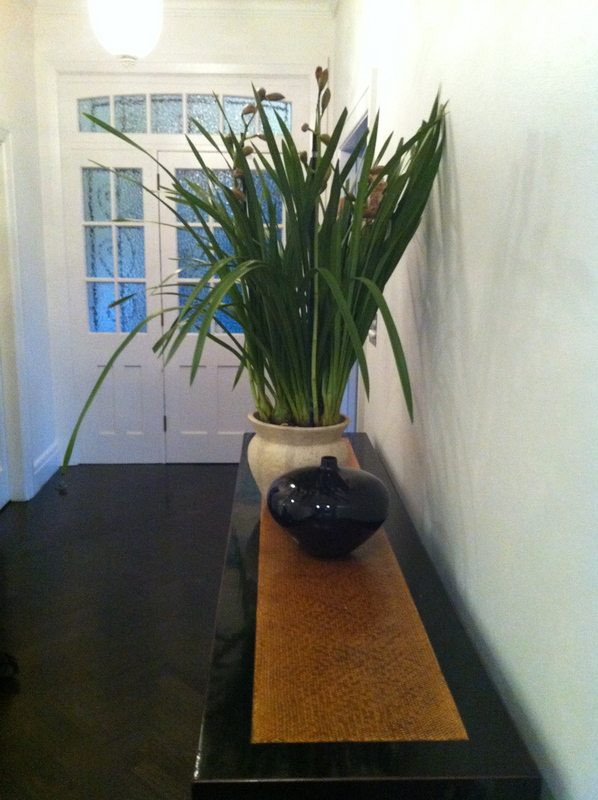 C and S arrived with yummy dinner last night, and the most magnificent orchid to grace the front hall. Happy days! 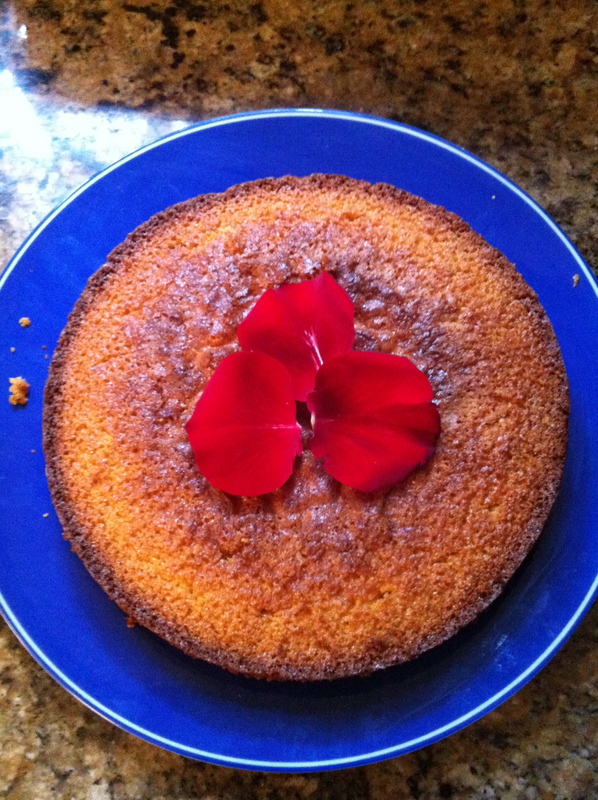 This entry was posted in GROUP B, Uncategorized and tagged Flowers, Gluten Free, Rose Petal Salad, Vegetarian by tgb9593. Bookmark the permalink.